Karl G. asks: Why does cheddar cheese turn orange when the milk used to make it is white? Milk is made up of about 87% water and 13% solids, such as fat and various proteins. Chief among these proteins is something called casein, four types of which make up about 80% of the proteins in milk. The casein protein molecules are typically suspended somewhat uniformly throughout the milk and are spherical, about a micrometer across. The reason they are somewhat uniformly suspended in the liquid is because kappa-casein molecules have a negative electrical charge, so they repel each other. White objects in nature appear such when there is some level of light diffusion going on and no part of the visible spectrum gets reflected off the object any more than any other part of that area of the light spectrum. As you might guess from that, these casein proteins and some of the fats in the milk scatter and deflect light somewhat uniformly throughout the visual spectrum. This results in milk being fairly opaque and appearing white to our eyes. This brings us back to the question at hand- if milk is white, why is cheddar cheese such a striking orange-ish / yellow color? Before more modern industrialized milk farming, cows grazed in pastures abundant with beta-carotene-rich grasses. As they digest the naturally orange-ish pigment in the grass, it is stored in their fat cells. When a cow gives milk, the beta-carotene-colored milk fat is secreted in globules, primarily made of triglyceride surrounded by a lipid membrane, which itself is surrounded by protein clusters. While the cow’s milk will usually still appear mostly white in the human visual spectrum, depending on the type of cow, the time of year, and the fields it’s grazing in, this beta-carotene laden fat can turn the milk an off-white, or in the extreme, a slightly golden color. With traditional cheddar cheese making, the beta-carotene infused fat is left in the milk, and after the rennet, bacteria and heat work their magic on the liquid, the protein clusters release their grip on the globules and their membranes dissolve, such that they are no longer opaque, making the beta-carotene a little more visible. Once the whey is drained and pressed out, the fat is also more concentrated in the final product than it was in the original milk. Thus, since the color comes from the beta-carotene in the fat, for those cheeses made this way (as opposed to things like higher acid cheeses or those made with goat or buffalo milk), those with the higher fat content will tend to take on a yellow-ish hue. Accordingly, cheddar, with approximately 32% fat content (compared to, say, whole milk mozzarella at about 17%) classically was a slight golden color (akin to butter that hasn’t been dyed), rather than the distinct orange/yellow color we typically associate with cheddar today. So why the change to deeper colors? According to Professor Paul Kindstedt of the University of Vermont, this started around the 16th/17th century in England. 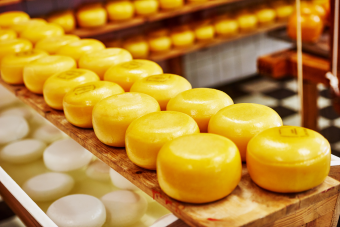 At this time, certain cheese makers began skimming some of the cream off the milk to sell separately before making the cheddar, lowering the fat content, but still producing relatively tasty cheese. This practice resulted in much paler, even white, cheddars, which consumers found (and still find) less desirable. To mask the true fat content, the farmers began adding color back in. Common colorants included marigold petals, carrot juice and even saffron, but most cheese makers ultimately settled on annatto, a relatively cheap and available seed containing pigments that will turn things a lovely yellow-orange, depending on concentration. When cheese-making became industrialized in the 19th century, many companies chose to continue the practice of dying certain cheeses like cheddar and, for marketing reasons, the exact hue of the cheese continued to move away from the classic light gold to more of the orange-ish / yellow we have today. Beyond any form of agri-fraud certain 16th/17th century cheese makers sometimes employed, this was something of a necessity on an industrial scale given that the manufacturers used milk from numerous different farms to make their products. Given the end color of the cheese could vary greatly based on things like the time of year, exact diet of the cows, and cattle used (Guernsey and Jersey cattle, for instance, tend to produce richer colored milk), it was very difficult to get a consistent color in a given brand’s product without dying the cheddar. And as consumers, much like today, strongly preferred near-pumpkin colored cheddars, the practice of dying the cheddar was a handy and cheap marketing trick. Speaking of diet, over the last couple centuries, many milk farmers have shifted away from primarily pasture-feeding their cattle to providing a dry feed diet. One of the key benefits to this is that the farmer can ensure a much more consistent tasting end product, though there does appear to be some sacrifice in nutritional value in doing this. More pertinent to this article, another negative side effect, at least as far as many consumers are concerned, is the dry feed diet lacks the beta-carotene of the pasture grasses, making the cheddar white, regardless of fat content, again requiring the annatto seeds to get the color consumers want. Many butter manufacturers dye their butters yellow for similar reasons, regardless of the quality of the butter itself or the diets of the cattle producing the milk- a noticeable golden color is simply what people expect the color of butter to be and if it’s not, they’ll usually buy the brand that offers that color. Without the fats, casein tends to scatter the blue wavelength slightly more than red. So with something such as fat free skimmed milk, you’ll sometimes see a very slight blue-ish tinge to the otherwise white milk because of this. Milk also contains riboflavin, which can give the milk a slightly green-ish tinge, if the concentration is large enough, such as can also be seen sometimes in certain types of skimmed milk or whey products (the riboflavin is in the whey portion of the milk). New York State cheddar isn’t yellow (or orange) either. The first time I saw cheddar dyed orange was in college. I thought I had made a mistake about the kind of cheese I was looking for. (Cheddar tends to be referred to as mild, medium, sharp, or extra sharp – the word cheddar isn’t used much). I am in Canada and cheddar cheese is quite popular here. Most of it is dyed a fairly strong orange colour, but the more high-end cheese manufacturers often offer white cheddar as well. For some reason, white cheddar is considered a bit fancier, and often the really sharp extra-old cheddar will be white. Every other kind of cheese here is left white, except Gouda and Monterey Jack which are pale orange. And then there is “farmer’s marble,” which is just white and orange cheddar marbled together. I’m not sure what the point is of that, but I’ve noticed it’s slightly lower fat than regular cheddar so it’s what I normally buy. I visited the Cabot Cheese factory in Middlebury, VT recently. All of the cheddar they sell in Vermont is white. However, they said they have to dye the cheddar orange if they are shipping it to the west as westerners will generally not buy white cheddar. Great article and excellent example of why I like this site.